Bags and Boxes of Kindling. Made from recycled timber delivered to your home or workplace for your convenience. nothing more nothing less”. 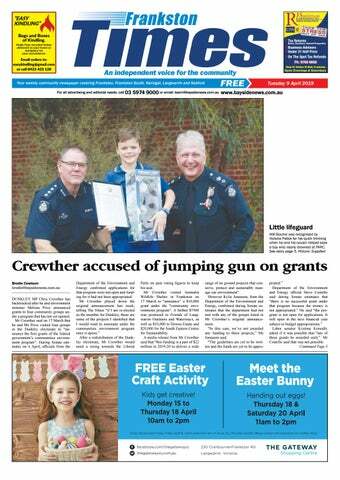 Liberal frontbencher Simon Birmingham, during the 4 April Senate estimates hearing, described Mr Crewther as a “very active and engaged local MP in his community”. “Local members of parliament advocate for local projects all of the time, clearly Mr Crewther is indicating projects he is committed to supporting in terms of getting grant applications,” Mr Birmingham said. Ms Price said the $22 million grant program was announced last March. tion to the alleged incident. His car was located in Seaford a little after 8am. He was charged with dangerous driving causing serious injury and failing to render assistance. Those charges are expected to be upgraded. The Parkdale man appeared in an out of session’s court hearing on 28 March. He was bailed to appear in Melbourne Magistrates’ Court on 1 August. Attention Schools, sporting clubs Wear your heart on your windows Shades is not just a word! 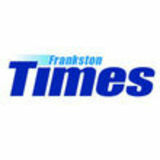 Free advertising listings Each month the Frankston Times will run a Community Events page, where your school or organisation can promote upcoming events, fund raisers, social events, etc. at no charge. This page is sponsored by Frankston Arts Centre, and listings are completely free. Lisiting should be about 40 words and include event name, date, time & address. Youâ&#x20AC;&#x2122;ll love what we do! A YOUNG Mornington woman who “always wanted to help people” is the first to enter a traineeship program at Mornington Peninsula CIU. Victoria Police launched the Aboriginal and Torres Strait Islander school-based traineeships in 2017 and the program is said to have “made great strides” since then. The program is designed for students completing years 10, 11 or 12 who are interested in a career with Victoria Police and is available at several police stations around the state. Ashcka Woods, 18, a Year 12 student at Mornington Secondary College, is completing the program as part of her Certificate III in Business. detective work.” Ashcka hopes to become a uniformed officer before deciding on a specific pathway as her career develops. She said she was “settling in and getting comfortable” at Somerville with small tasks and computer work that align with her course. Her main goal is to finish school and complete a business diploma before becoming an officer and “sticking with it”. Ashcka said she was looking forward to working with another trainee at Frankston police station soon and, in July, doing a three-day live-in component at the Police Academy with 40 other trainees. Frankston police station currently hosts two people enrolled in the program. Anyone interested in applying for the program can visit the Skills Invest website. owners charged.” “It’s not ok to be walking your dog, minding your own business and then next thing you know your pet and yourself are being attacked by an uncontrolled dog. It’s imperative for all dog owners to practice responsible ownership, this includes making sure your dog is secured within your property or is in your control when out in public,” he said. “It is also important to remind all residents of the importance of cooperating with Council officers when they are required to take lawful action to protect the community.” The female dog has not been put down. TERM TWO - 2019 ACCREDITED TRAINING FOOD SAFETY - SITXFSA001 USE HYGIENIC PRACTICES FOR FOOD SAFETY. Cost: $90.00. $80 Concession Skills and knowledge needed for basic food safety - essential staff and volunteers involved in the preparation, storage, service of food and beverage or in contact with food/food preparation surfaces in their workplace. Date to be advised. MAKE THE CALL ASK YOUR ENERGY COMPANY FOR A BETTER DEAL As of January 1st, providers have dropped prices on their most expensively priced plans due to pressure from the Government. But if you really want to save, simply call your energy company and ask them for a better deal. You could lower your bill by $600 a year. Visit our website for tips on calling your energy company. join us under the stringybarks Musical gives progressive twist to tale A GROUP of performers will take to the stage at Frankston High School to tell the tale of Rumpelstiltskin, with a modern twist. Jack Green, who graduated from Frankston High School himself in 2017, said that he has been working on the musical since late last year. “I started writing this in December and it’s all original, the script and the songs,” he said. “It’s all coming together really well. We have six members helping run the show, and four are performers.” He said the show helped bring the story of Rumpelstiltskin into modern times. “Rumpelstiltskin is a story of a young girl, but our show is slightly different to what were values presented in the traditional one,” Green said. Br ing the whole f amily f or amazing live music, incredible f ood, local beer & wine, fun f or the kids and the best collection of market stallholders in Melbour ne f or the LAST MARKET OF THE SEASON! MR MORRISON, ’ YOUR TIME S RUNNING OUT. Australia’s nurses, doctors, care workers, geriatricians, paramedics, over 300,000 community members, a growing number of parliamentary candidates – and counting – all agree we need guaranteed numbers of staff for aged care, but our elderly continue to suffer because you’ve delayed taking action. Speak to your agent about listing on realestateview.com.au. Prized piece of land of approx 2500sqm (over half an acre) Overlooking a serene rural setting All services available Perfect for building the dream family home Blocks as perfect as this will soon be gone Only minutes away from cafes, supermarkets schools, child care, gyms, doctors & parklands. Puzzles supplied by Lovatts Publications Pty Ltd www.lovattspuzzles.com See page 24 for solutions. 7PM -10PM $12 (Sk8 Hire $3) GAMES EVERY SESSION! Real Estate section of Network ClassiďŹ eds. SUMMERVILLE 47 Summervill cresent, SAT 13th, 8am - 2pm, Massive sale 3 house lots! Tools, furniture and a lot more! No Early callers. Division One Premiers: The City of Frankston Bowling Club defeated Somerville on 16 March’s pennant final to claim their first Division One premiership in 17 years. The club also won divsions one, two and four in midweek pennant topping off a successful year for the club. Did you know... you can view our papers online THINKING OF SELLING? Speak to your agent about listing on realestateview.com.au. RESORT LIVING EVERY DAY. RETIRE IN SOUTH GIPPSLAND. Experience the boutique retirement dream at Mountain View Leongatha Be on a permanent holiday by joining our exclusive community. Choice of 2 & 3 bedroom master built luxury homes with single or double garages. A 24 hour emergency call service and secure caravan and boat storage for peace of mind. Contact us for further information. Master built luxury homes. Double Garages now available Community Centre completed and operational.